The Grotowel is a hooded wrap around towel for ages 6-48 months. Its clever hood is shaped to help speed up the drying of hair, whilst the large towel has lots of length for little ones to be wrapped up warmly. The Grotowel is available in 4 different themed characters in a range of colours, giving plenty of choice to both parents and children! The Groswaddledry is a swaddle shaped towel for new-born bath time. 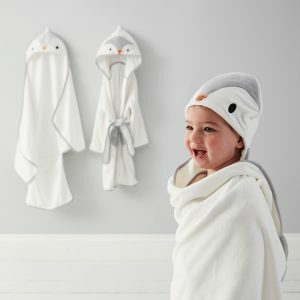 It will allow parents to recreate the soothing effects of swaddling after bath time, as well as quickly drying their baby before they get cold. The Groswaddledry is available in 4 different themed characters in a range of colours, meaning there is a design for everyone. The Grorobe is a bath time essential for all parents. 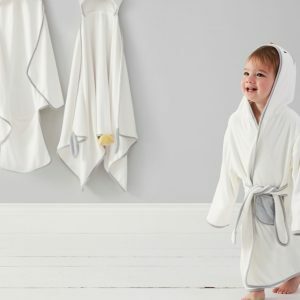 Available in 4 different characters this bath robe has a shaped hood perfect for fitting over little heads to speed up the drying of hair.